Here’s another last minute Christmas present, this time for your Android-obsessed friends. 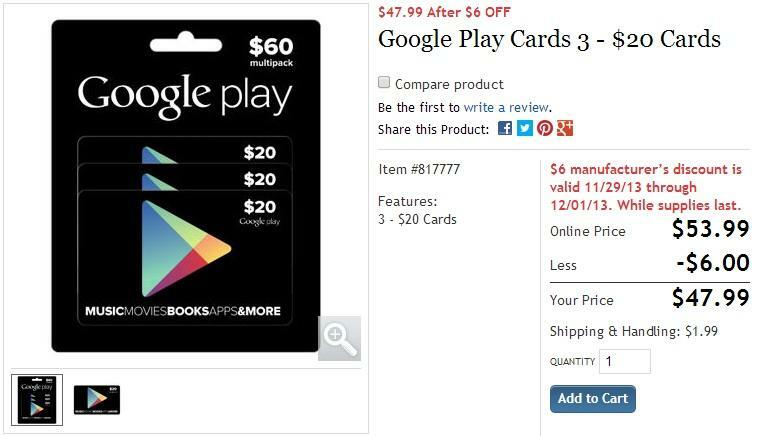 This weekend, Costco is allegedly bringing back its Google Play gift card discount, offering a $60 multi-pack for $47.99 instead of the usual $53.99. The news come from Reddit, where one user who claims to work for Costco at the corporate level reveals the gift card discount will be in effect this weekend, Dec. 21 and 22. The big box retailer offered the same deal last month for a few short days, knocking $6 off the item’s regular price. Factoring in $1.99 for shipping and handling and an additional fee for non-Costco members, you’ll still save $7 when you order online. There are some restrictions to what you can spend your gift card on though. All devices as well, as a subscription to Music All Access are unfortunately off the table, though you can still use it to buy apps, music, videos or e-books through Google Play. The discount should be available in the U.S., though it’s unclear if the same offer will apply in Canada.